KitKat continued to decline however, dropping .9% to 29.2% in August while Jelly Bean also declined by the same .9% to 16.7%. You can see from the graphic from the report that much older version of Android are still out there including v2.2, Froyo, holding on desperately at .1%. Looking at things with regards to ClintonFitch.com, Android Marshmallow has a just higher adoption rate from readers. 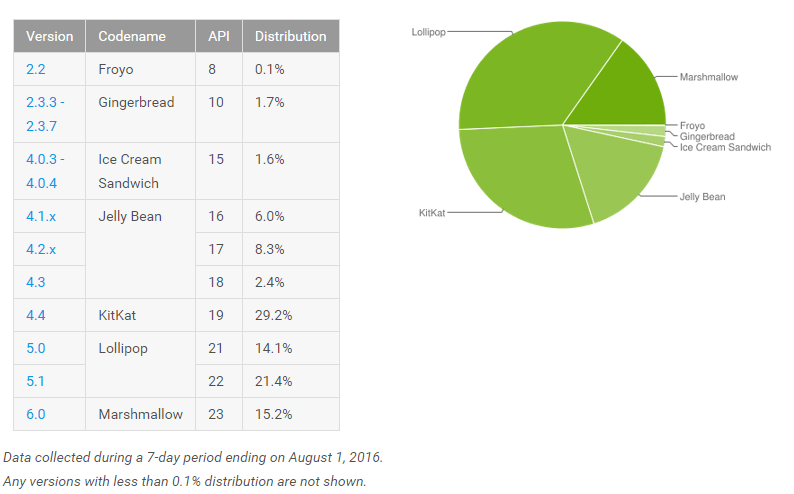 For the same time period, 70% of all Android devices coming to the site ran Marshmallow just 15.89% ran Lollipop. KitKat users hitting the site made up 1.9% of the install base while Froyo made up .8% of the total. Interestingly, Android Nougat made up 2.45% of visitors to this site. Google themselves won’t list Android 7.0 in this report just yet given that it isn’t officially released. comment of the day my friend. Comment of the day!